Are You a Federal Employee Looking at Retirement, but, Don't Know Where to Begin? Later in their careers, many Federal Employees know they should start preparing for their retirement, but, don't know where to start. Are you searching for a way to meet your retirement goals while balancing with the desire to retire soon? Are you seeking a plan to create the income you need when you transition into retirement? Are you concerned that you will make a mistake that could negatively impact your quality of life during retirement? Are you looking for information that will help you make informed and intelligent financial decisions now? If you answered yes, to any of these questions, then you should seek an independent advisor who understands the specifics you face as a Federal Employee and can help clarify confusing retirement subjects. • Get the most from your TSP and other retirement assets. To gain more information and request a no-obligation consultation, contact us. 1) New Survey Shows The Top 3 Reasons Many Feds Are Not Retiring: How Would You Have Responded? 2) Federal ‘Boomers’ Fear Insufficient Retirement Income… Are They Wrong? 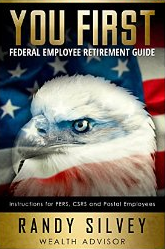 To purchase a copy of "You FIRST: Federal Employee Retirement Guide", click the book cover below.